The EMT 251 Digital Reverbs are great units but nearly every model now suffers a burned out display. Original Papst Type 900 Round 24-42 VAC Fan For EMT 250 251 Tested w/Capacitor. 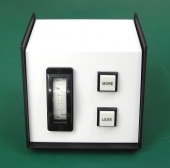 Custom EMT 140 Reverberation Unit Desktop Decay Time Meter & Remote Control. Lot Of EIGHT NOS EMT 140 Reverb Plate Wire Clips. EMT 251 Upgrade Kit, Add Original EMT 250 Reverb Program To Your EMT 251. NOS Texas Instruments TMS3122 / 2518 6-Channel Shift Register IC For EMT 250. NOS Mitsubishi MST4044 18-Pin DIP 16 Bit RAM IC, Guaranteed. NOS 2102 (91L02) RAM IC For EMT 250 Early Type RAM Board and Other Products. NOS Piezo Mic Pickup Transducer Assembly For EMT 140 Echo Plate Reverb Unit. NOS EMT 140 Reverb Time Meter w/Bezel & Hardware For 140 Plate, Good Cond. NOS EMT 140 Reverb Plate Flat Clip.